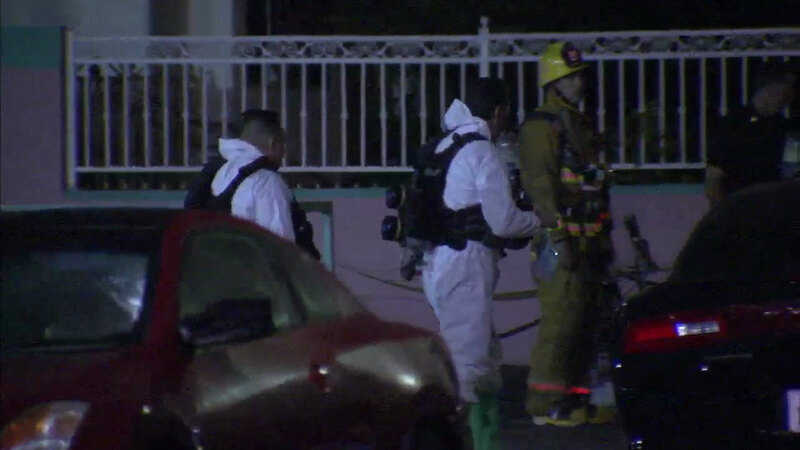 SOUTH LOS ANGELES -- An infant was found dead and an 8-year-old girl and a woman were hospitalized early Thursday morning after the three victims were discovered outside a South Los Angeles store, each of them naked and covered in a white powdery substance, police said. The grim discovery was made just before 2 a.m. in a parking lot near the intersection of San Pedro and 23rd streets, according to the Los Angeles Police Department. The 26-year-old woman, believed to be the mother of the two children, was in critical condition. She was seen being placed on a stretcher and transported to a hospital along with the 8-year-old. The surviving child's condition was unknown. A firefighter-paramedic was seen carrying what appeared to be the deceased 2-month-old baby girl's body, wrapped in a blanket. A hazardous materials team also responded to the scene in an effort to identify the powder that covered the victims and the ground near them. The substance was determined to be a baby product, the LAPD said. Police described the woman and children as residents of the area near the market. Initial reports indicated the woman may have been screaming for help before officers arrived. The store's owner said the woman was barefoot when she purchased three cans of Ajax cleaner and latex gloves on Wednesday, adding that the 8-year-old girl was also present and crying at the time. "The girl, she was crying all night long," said store owner Sunhee Chung. Chung added that the mother wasn't acting like herself when she bought the cleaner. Chung said she appeared disheveled. There were no obvious signs of trauma on the victims' bodies when they were found. No information about a possible suspect was given. Investigators were at the home where the infant lived to collect evidence. Neighbors said they were concerned the woman was in an abusive relationship with a man, believed to be the father, and said she may have tried to harm herself and the children. "We would hear all this loud cursing and you'd hear a lot of arguing going on with him and her," said Johnette Green, of South Los Angeles. An unidentified man was seen in handcuffs as police conducted a preliminary investigation at the scene. He was later released. Authorities did not identify the father of the children, but said they want to speak to him and other family members to see if they can provide more information on the case. They have not been able to question the mother. Authorities are investigating the infant's death as a homicide.